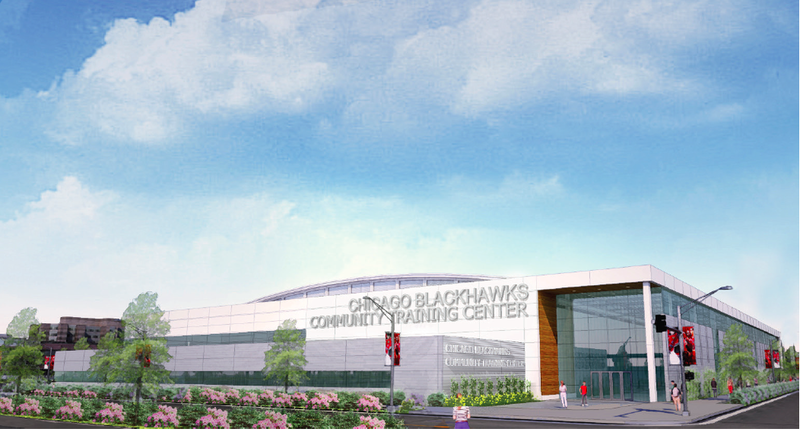 The Chicago Blackhawks announced an agreement with the city of Chicago today for a 125,000 square foot community center to be located just south of the United Center. Its exact location is where Malcolm X College currently resides. They will be moving to a new campus next year. Construction is expected to begin on the new facility next year and be finished within the next two. The training facility will be privately funded and will cost an estimated $50 million. 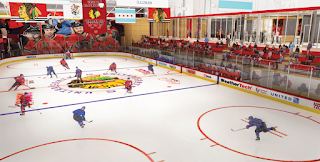 Blackhawks Chairman, Rocky Wirtz stated today that it will contain 2 NHL-regulation size rinks. Earlier in the week, it was announced that Chicago is one of five finalists in hosting the 2018 World Junior Hockey Championships. The tournament would require multiple rinks. One would think that this would add some brownie points in possibly winning the tournament. 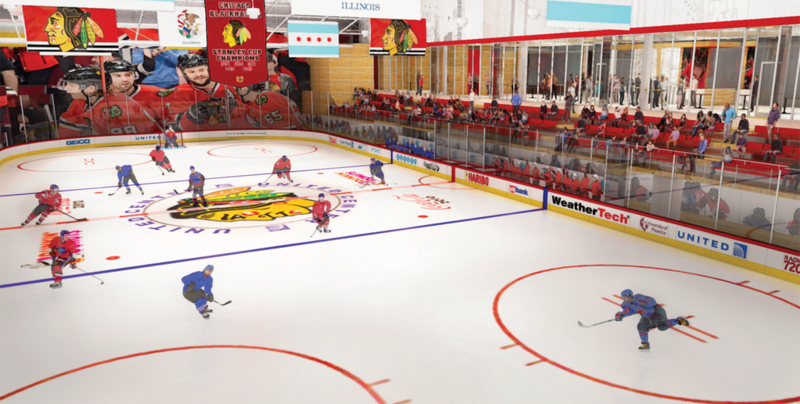 The main reason for the facility though is to grow the sport more so than it already is in Chicago. 94% of the new facility will be used to serve the surrounding community and not the team. 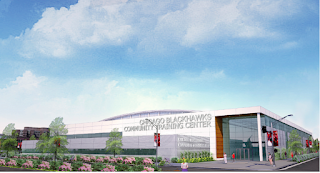 Youth hockey will benefit the most from the new facility. Wirtz said today, "We wanted to do something special on the West Side." 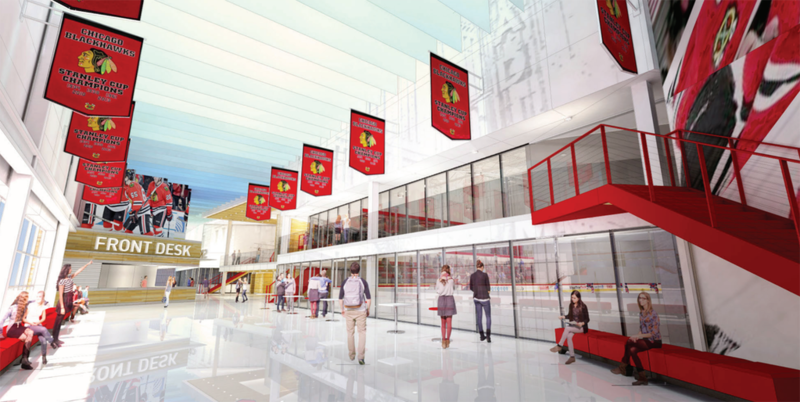 Blackhawks President and CEO, John McDonough, added, "This is going to provide tremendous opportunity." Chalk up another win for this franchise and the city. It's still amazing to think how far this team has come in less than 10 years. If one would say that home games were going to be televised, that the Hawks would win 3 Stanley Cups within six years, and that the franchise, which was once dubbed the "worst franchise in all of professional sports", would be considered "America's team", I'd say you had been spending too much time and money invested in the Wirtz Beverage Group! After witnessing it in person...a drink is in order...to celebrate! There was news on the Marcus Kruger front today as Chicago Tribune's Chris Kuc reported that he talked with Kruger's agent, J.P. Barry. According to Barry, both the Blackhawks and Kruger are being patient. A long-term deal was said to be in the works, but today Barry stated that Kruger "will have no choice later in August but to do a shorter deal". Stan Bowman has not found the right trading partner for the likes of Bryan Bickell or Kris Versteeg yet. It is clear that Kruger wants to stay with the Hawks and time will tell what kind of deal can be made to keep him wearing the Blackhawks sweater. Kruger, a restricted free agent, could have taken the Blackhawks to arbitration if he wanted to, but chose not to. A sign that he wanted to get a long-term deal done. One signing that did occur today was in the Blackhawks front office. Jamal Mayers, a member of the 2013 Blackhawks Stanley Cup team, and was up till now, an analyst for Comcast SportsNet for Blackhawks broadcasts as well as for the NHL Network. Today, he became the Community Liaison for the Blackhawks. Blackhawks president & CEO John McDonough said in a statement, "We are proud to welcome Jamal back to the organization in this role. We envision him being a strong asset to the Blackhawks as we continue to focus on the growth of youth hockey. Jamal's involvement in our local neighborhoods will help to further ingrain the Blackhawks brand into our community." Congratulations to Jammer! Who Do Blackhawks Look At To Replace Scoring? The Chicago Blackhawks will be looking for others to step up to replace the scoring of Brandon Saad, Patrick Sharp, Brad Richards, Antoine Vermette, and Johnny Oduya. They combined for 53 of the 229 goals scored in the regular season (23%) and 20 of the 67 goals scored in the playoffs (30%). They may lose even more contributors from last year if Bryan Bickell and/or Kris Versteeg are moved. They both had 14 goals a piece in the regular season. Their stories are yet to be told since the Blackhawks are currently, roughly $350K over the salary cap. This while Marcus Kruger, 7 goals, and also a very good penalty killer, waits to sign a long-term deal with the club. So who will make up the scoring gap lost by these players? The additions of Artem Anisimov, Marko Dano, and Trevor Daley are the leading candidates. Let's speculate, shall we? Anisimov, is set to be the 2nd line center for the Hawks for the next 5 years thanks to an extension after being part of the trade for Brandon Saad. Playing on a line with Patrick Kane, one would think he would have the potential for 45 points (12G 33A) if healthy. Dano, who in his rookie year last year with Columbus, had 21 points in 35 games (8G 13A). The future is bright for this 20 year old who could possibly put up 40 points (14G 26A) based on what line he is placed on. Daley, who is an offensive-minded defenseman, should carry his weight for the amount of scoring that Oduya did last year (2G 8A, 10 points). Daley had career numbers last year in Dallas with 38 points (16G 22A). He may not reach those numbers next year adjusting to the defensive-minded game of Coach Quenneville, but he should easily surpass Oduya-type numbers with 32 points (10G 22A). There is the potential of the young Russian star, Artem Panarin, to break into the Opening Night roster along with fellow KHL linemate, Viktor Tikhonov, and young Swedish Defenseman, Erik Gustaffson. Panarin, a star in the KHL last year had 62 points (26G and 36A) for St. Petersburg SKA. He could play wing on any of the first 3 lines and make an impact. Tikhonov, who was a teammate with Panarin in St. Petersburg SKA, could give some support on possibly the 3rd line if given the opprtunity. Gustaffson, may or may not make the NHL squad although he is the closest to do so out of camp. His contribution would be similar to Johnny Oduya. Based on these projections, as good or bad as they may be, these newcomers, minus the potential stars, would make up 36 of the 53 goals that were lost. If Patrick Kane can stay healthy and stay on his 1+ point per game pace, he should be able to contribute at least another 1/2 dozen goals. 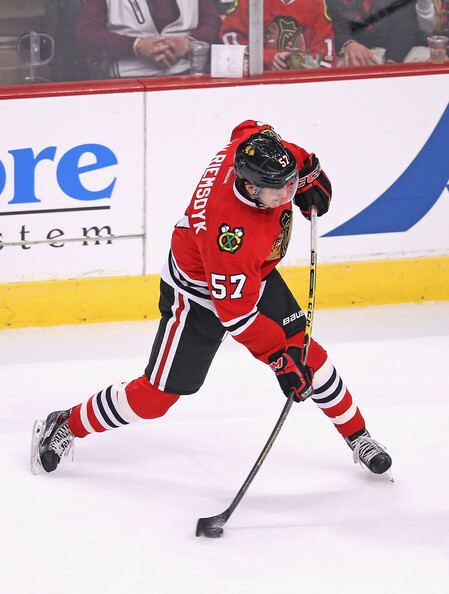 Teuvo Teravainen could have a breakout year next year. Based on his play in the playoffs this year, his poise and skill could see him easily netting a dozen goals or more. As scary as it was to lose stars such as Saad, Sharp, Richards, Vermette, and Oduya, the Blackhawks brought back players to fill the void. They will be relying and youth and skill to produce. What they lack is experience, which players like Toews, Kane, Hossa, Keith, and Seabrook could help with. Speculation is part of the fun till the games begin, so far now, let's get excited for what is in store for this upcoming year for our Blackhawks. Who do you think will contribute this year and how much? 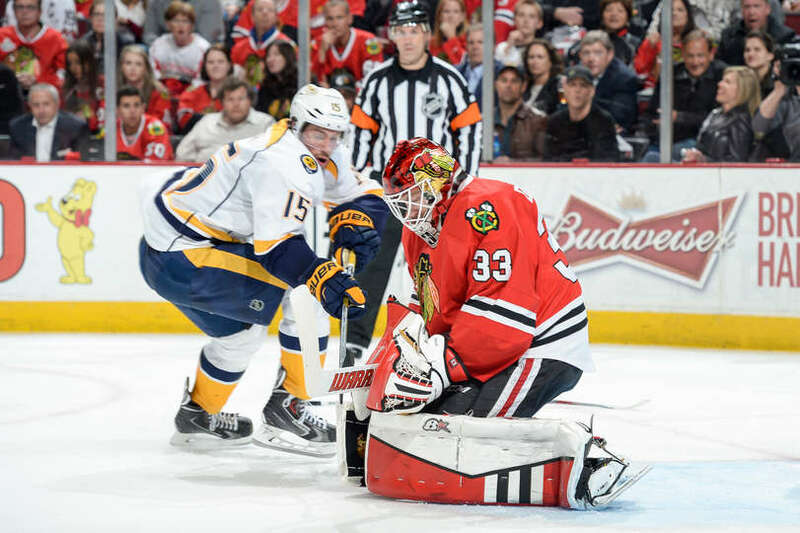 Who Was The Blackhawk MVP For The 2015 Season? 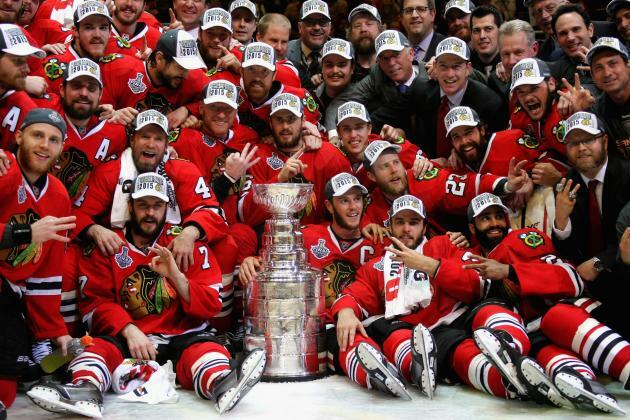 The Chicago Blackhawks capped off yet another Stanley Cup run In 2015. This season was filled with surprising performances from key contributors. Trevor Van Riemsdyk started the season by making the Opening Night roster and played well for the first 18 games of the season before going down with an injury. He then didn't return for the next 7 months until he played a pivotal role in the Finals. We saw the rise of local star, Scott Darling, win the backup goalie job half way through the season and provide the Blackhawks with a phenomenal playoffs when they and Corey Crawford needed him most. His record-breaking relief appearance in Game 1 against the Nashville Predators, 42 saves in 67+ minutes with no goals allowed, was one for the ages. 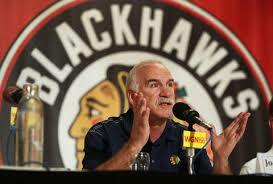 Coach Quenneville said "...that was one of the greatest relief performances you're going to see." Did I mention that was Darling's NHL debut in the playoffs? Although everyone on the team had highlights throughout the season, there are 4 players that should be considered for the honor of Team MVP for the entire 2014-2015 season. 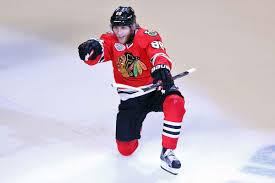 Patrick Kane was among the top scoring leaders and was in discussions of being League MVP before he went down in early February with a broken clavicle. That injury kept Kane out for the remainder of the regular season and was thought to keep him out until possibly the Conference Finals, if the Blackhawks could get that far. Kane came back five weeks early to begin the playoffs. He didn't skip a beat as he played a major role in the playoffs as he finished tied for most points in the NHL playoffs with 23 (11G, 12A). Duncan Keith, the reigning Norris Trophy winner in 2014, had a great year in 2015 tallying 10 goals and 35 assists for 45 points, finishing 5th on the team. His performance in the NHL Finals was near brilliance, averaging 31+ minutes, 3 game-winning goals, +16, and 21 points (3G 18A). His efforts earned him the Conn Smythe Trophy as playoff MVP. Considering the off-ice problems that surfaced after the season ended, his performance this year was truly amazing. Jonathan Toews, lived up to the "C" on his sweater as he lead the team in scoring in the regular season with 66 points (28G 38A). During the last two weeks of the regular season, when goals were hard to come by for the Blackhawks, Toews had 6 goals in the remaining 10 regular season games. 4 of those goals were game-winners. The Blackhawks made the playoffs this year by 3 points. In the playoffs, Toews had 21 points (10G 11A) and won 56.1% of his faceoffs. Corey Crawford had arguably his best season as a professional in 2014-15. He had 32 wins, a GAA of 2.27, and a SV% of 0.924. He shared in winning his second William M. Jennings Trophy. After a forgettable start to the 2015 playoffs against Nashville, 2-1, 4.66 GAA, 0.850 SV%, he was lights out the remainder of the playoffs going 11-5, 2.06 GAA, and a 0.932 SV%. He also had 2 shutouts, including one in the Stanley Cup clinching Game 6 against the Tampa Bay Lightning, 2-0. It's hard to pick a single person out of this group considering the crucial roles that all of these players had throughout the entire season. There are no losers in this debate. Only winners. Stanley Cup Winners!!! Websters dictionary defines a dynasty as: “a powerful group or family that maintains its position for a considerable time”. The Edmonton Oilers won 5 Cups in 7 years during the ‘80s and some would say that they were the last of the hockey dynasties. The Detroit Red Wings won 4 Cups over an 11 year period from 1996-2008. Some debate that they belong in the Dynasty Club as well. The 2015 Stanley Cup Champion Chicago Blackhawks have now tossed their name in the basket as the next arguable hockey dynasty. 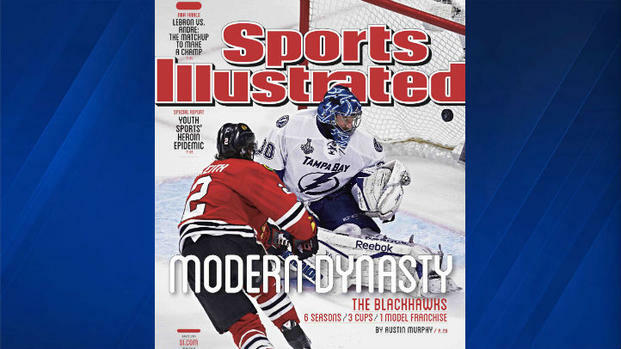 There is one difference that the Blackhawks had to deal with that none of the prior hockey teams, dubbed a dynasty, had to. The dreaded Salary Cap. The Blackhawks waited 49 years to become Stanley Cup Champions in 2010. 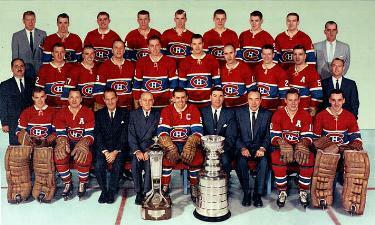 Within the following week, that team was dismantled to where half of that team were either traded or not re-signed. The salary cap was introduced after the 2004-2005 season was completely cancelled due to a lockout. It was put into place so that teams would be limited in spending a certain amount of money based on the revenue brought into the league the prior year. This would bring parity to the league. And that it did. Since it’s conception, the Chicago Blackhawks with their Cup win in 2013, were the first team to win multiple Stanley Cups in the salary cap era. With the Blackhawks winning again this year, (note: they missed going back to the NHL Finals in 2014 by losing to the Los Angeles Kings in game 7 of the Western Conference Finals in overtime), they have now won 3 Cups in the last 6 years. Because the league is now, and will forever be, locked into a salary cap, the definition of a dynasty should be redefined to include the phrase ‘salary cap era’. 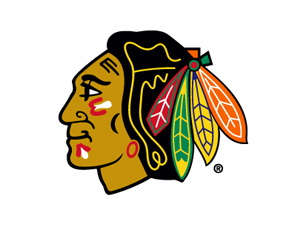 Based on the Blackhawks success, (they also have reached the Western Conference Finals in 5 of the last 7 years), the Chicago Blackhawks should be declared a ‘Modern-Day Dynasty’. Will they continue to add to their total? A bold suggestion, but a valid one since they still have Jonathan Toews, PatrickKane, and Duncan Keith for 8 more years, (all were named Conn Smythe MVPs for the last 3 Cup titles), Marian Hossa and newly acquired Artem Anisimov for the next 6 years, Corey Crawford for the next 5 years, and Niklas Hjalmarsson for the next 4, there is a very good chance that they can claim Lord Stanley’s Holy Grail yet again. If so, that would lock them as a genuine dynasty and not just a modern-day dynasty. 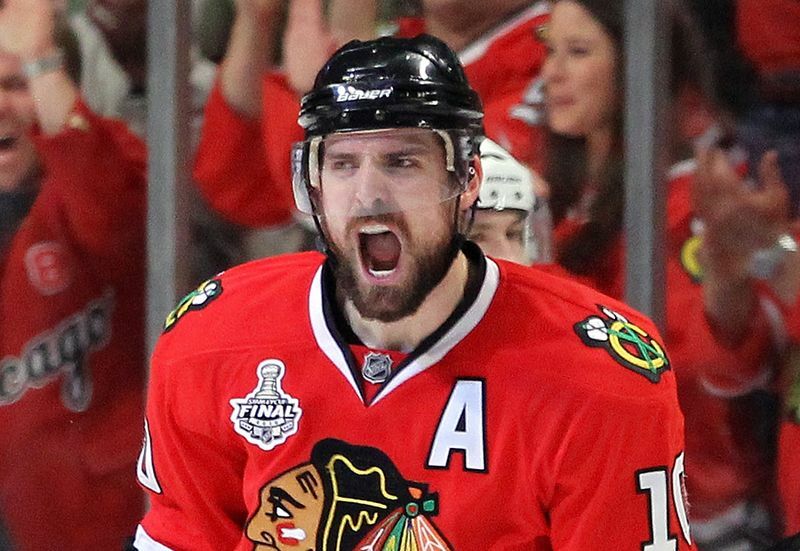 Now That Patrick Sharp Is Gone, Who Gets The "A" As Alternate Captain? During Saturday's coaches panel session at the Chicago Blackhawks Convention, Joel Quenneville was asked a debatable question by a fan that some have been speculating since the departure of Patrick Sharp. Who will be wearing the "A" as alternate captain that Sharp once wore? So since Coach Q won't tell us, let's have a little bit of a debate of a few players that we think are worthy of wearing the "A" on their Blackhawks sweater. Patrick Kane - He's come a long way since his rookie year 8 years ago, all spent with the Blakchawks. He's become one of the most exciting players on the ice and is one of the few that can take control of a game. He leads by example and can easily be a leader on this team. He tallied his 500th career point last year. Marian Hossa - a 17-year veteran in the NHL, has spent the last 6 years as a Blackhawk and is still among one of the best two-way forwards in the game. 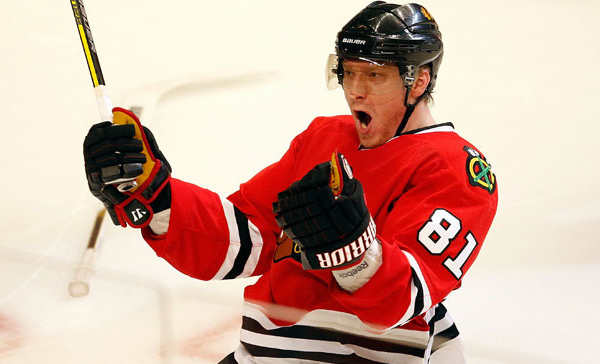 Hossa recorded his 1000th career point last year and should net his 500th career goal by this upcoming Christmas. Kane, among others, credit Hossa in teaching them the game and making them better players. Newcomer, Marko Dano has admitted already to emulate his game from Hossa. Hossa's career +/- rating is +228. Brent Seabrook - Other than Duncan Keith, Seabrook has the next longest tenure on the team, spending his entire 10 year career with the Blackhawks. He has filled in as an "A"lternate when needed and has been a reliable defenseman on this team and comes up with huge goals in huge situations . 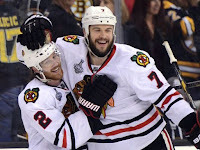 In the 2013 playoffs against Detroit, Jonathan Toews took 3 penalties in a crucial game and Seabrook was the one to talk to Toews to calm him down and provide the added leadership when needed. If I were to make a wager, I would put my money on Seabrook. The great thing about all of this, is there is no wrong answer. What a great problem to have. Who do you think takes the "A"? The 2015 Chicago Blackhawks Convention set off at 5pm yeterday at the Hilton Chicago before a roaring crowd. Blackhawk players, prospects, and legends lined up to fans' delight as they were announced by Ed Olcyzk. 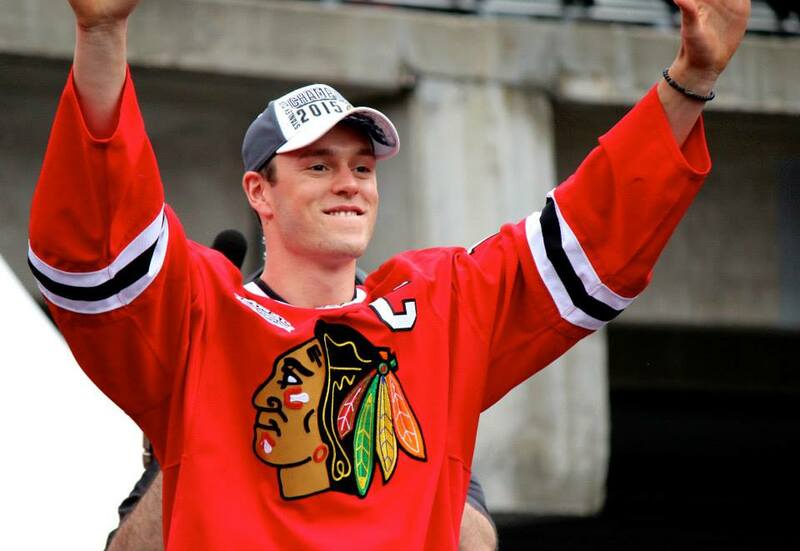 Jonathan Toews brought up the rear hoisting the Holy Grail of all of sports, The Stanley Cup. The buzz wasn't just around the fans, as players, coaches, and staff were asked questions of all sorts from the media. "... Nick Schmaltz was particularly impressive at prospects camp." 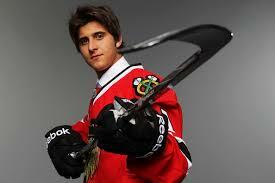 Nick Shmaltz, was the 1st round draft pick (20th overall) of the Blackhawks in the 2014 NHL Draft. "... Erik Gustafsson caught his eye among the defensemen. He's determined to make the team out of camp." Erik Gustafsson was originally a 4th-round pick (93rd overall) of the Edmonton Oilers in the 2012 NHL Draft. He signed a two-year entry-level contract with the Blackhawks at the end of April of this year. If he makes the Opening Night roster, his cap hit would be $667K. Bowman also stated that the Blackhawks, "have $750k in bonus overages from last season. That'll count against the cap this upcoming season." As if the Hawks didn't have enough to worry about. Bonus overages occur, in this case, because young players, Teuvo Teravainen, made the NHL club earlier than expected. As for Kruger talks, they were still ongoing, but still without a resolution since things still need to be done (a trade of hopefully Bryan Bickell and/or Kris Versteeg) in order for the team to be under the cap. Joel Quenneville stated today that he has Teravainen slated as a center for the 2015-16 season. He also was surprised of the Brandon Saad trade although he mentioned of having more NHL-ready players for this upcoming season. Back in 2010 when that Stanley Cup team was dismantled, there were mostly prospects and draft picks brought back in return. This time, Artem Anisimov, Marko Dano, Trevor Daley, and Ryan Garbutt will all be part of the Opening Night roster and will be key contributors throughout the season. One other thing of interest was that Bryan Bickell had a tooth removed earlier in the week. At this point, his vertigo issues have gone away. This would be a good sign. Whether it means he starts playing to his capabilities that we've waited to see when he came alive in 2013, or that this clears up any mystery for other teams to not be afraid to trade for him. Hopefully it is the latter and he along with Versteeg can leave to make way for others battling for spots that have been waiting for a long time in Rockford, like Mark McNeil, and Philip Danault. Johnny Oduya found a new home. 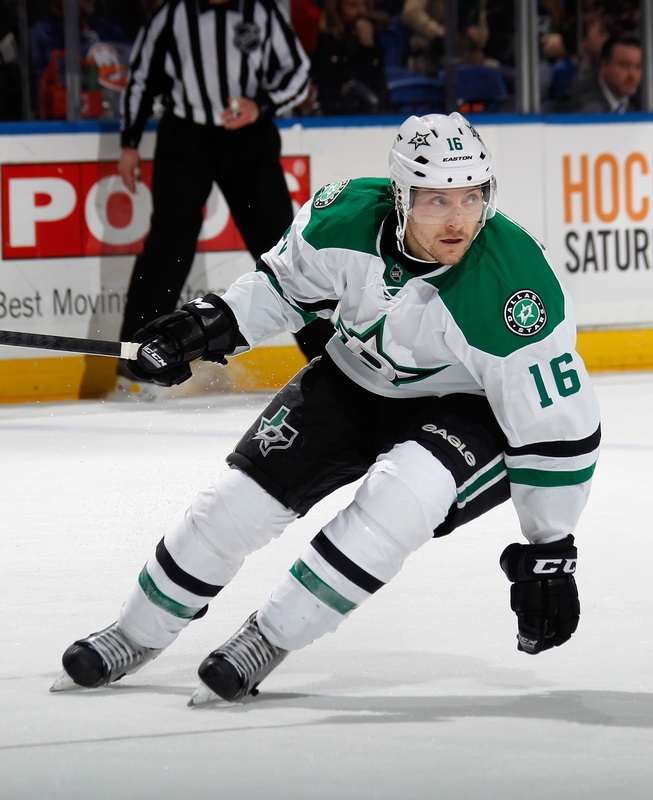 He joins recent additions Patrick Sharp and Stephen Johns as the newest player of the Dallas Stars. Although he never played with him, another ex-Blackhawk joined Dallas this year when Antti Niemi joined the club. 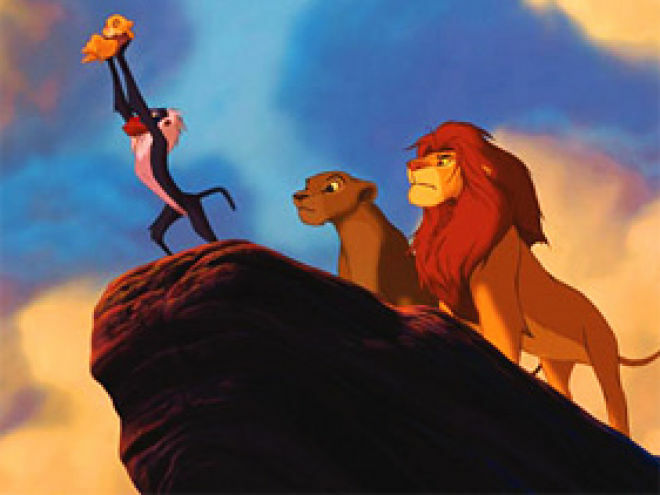 Suddenly, Dallas is the new "Blackhawks South" taking over the reigns from the Florida Panthers. 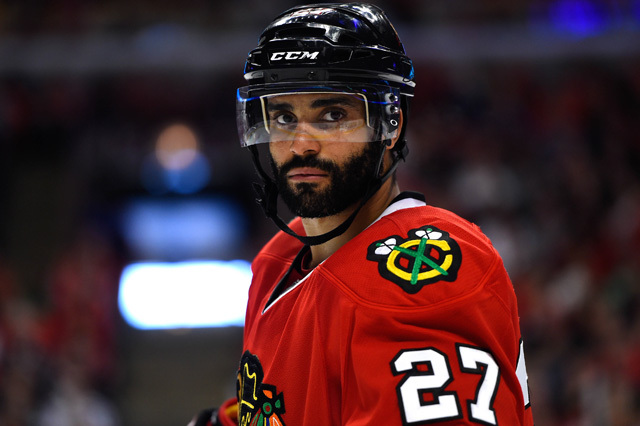 Oduya signed a 2-year deal worth $7.5 million, with an average cap hit of $3.75 million. Dallas has cleaned house lately with Blackhawk players. Needless to say they have gotten better this off-season. We will see how good they will be when the Blackhawks face them in the regular season. Their first meeting will be Tuesday, December 22nd in Dallas. The first game at the United Center will be Thursday, February 11th. The Stars come to Chicago for a pre-season game on Saturday, October 3rd. But as we know in pre-season, there is no guarantee what players will appear in those games. But more importantly, LET'S GO HAWKS!!! An old rivalry will be brought back to life as alumni members of both the Chicago Blackhawks and the Minnesota North Stars, and Wild, will face off as part of the NHL Stadium Series next February. A day prior to the scheduled game between the present-day Blackhawks and Wild, one of the most hated rivalries in the NHL will be celebrated in a much anticipated reunion. In the 1980s and early '90s, the Blackhawks/North Stars rivalry was one of the most hated in the entire NHL. PRE-GAME brawl 1989 - Yes, you read that right. This brawl happened during pre-skate. Ah the good old days of Old Time Hockey. Bench-clearing brawl - 1983 - The Blackhawks' Denis Savard, and Minnesota North Stars' Dino Cicceralli started this beauty of a brawl that lasted 20 minutes before play would begin again. The list goes on. Among the Blackhawks that will play in this game include, Denis Savard, Steve Larmer, who should be in the Hockey Hall of Fame, and Al Secord. These three were one of the most potent lines in Blackhawks history in the 80s. Among the North Stars alumni, Dino Ciccarelli, Mike Modano, Neal Broten, Basil McRae, Bobby Smith, Willi Plett, and Don Beaupre. It's doubtful that any brawls will come from this game, but odds are that Ciccarelli wil do one of his patented dives as he did often back in the day. In today's NHL, there is a thing called a diving penalty. It's too bad it wasn't implemented back in the day. Maybe Ciccarelli would not have scored as many goals in his career. Regardless, this is a game that die hard Blackhawk fans cannot wait for and may enjoy more so than the actual game the following day. Kirill Semenov scored twice today in a losing effort as Team "A" lossed to Team "B" today at Blackhawks Prospect Camp. Semenov, 20, played in the KHL with Omsk Avangard last year. Hirano is a Japanese-born winger who has been playing for Tingsryds AIF in Sweden's top junior league. Aston-Reese's goal was his second during this year's Prospect Camp. Veteran defenseman, Johnny Oduya, decided that he would no longer wait to see if the Chicago Blackhawks could find room to sign him. Per his agent, Don Meehan, said today that he would not be re-signing with the team. Oduya's decision was made easier to move on when the Blackhawks traded fan favorite, Patrick Sharp, to the Dallas Stars last week. 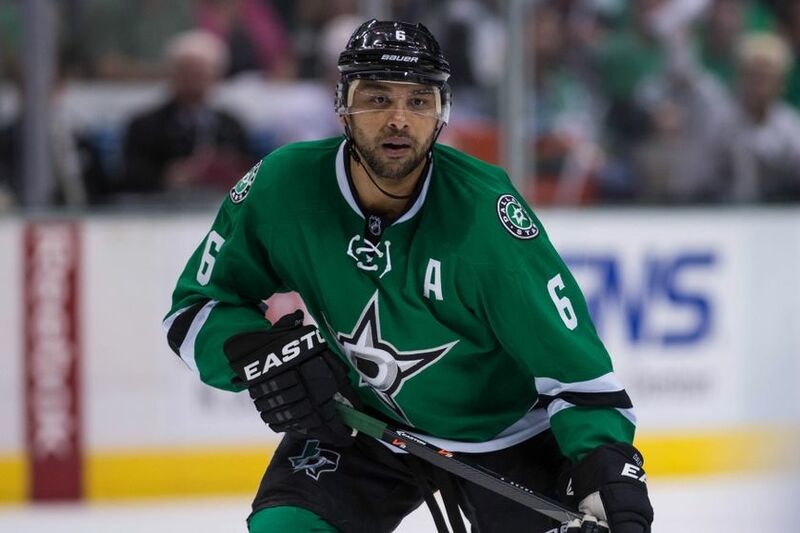 In return, the Blackhawks received veteran defenseman, Trevor Daley. 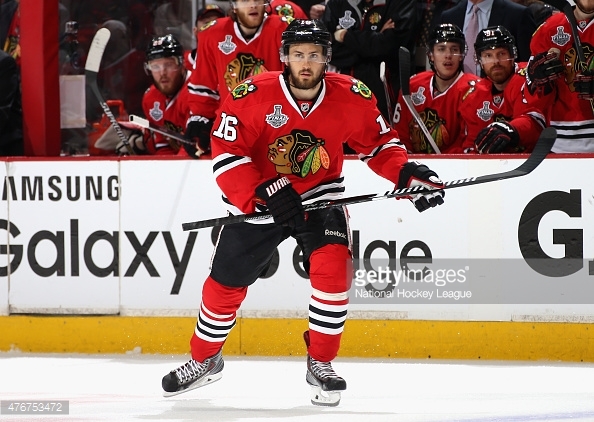 Daley is somewhat similar to Oduya and will most likely skate along side, Niklas Hjalmarsson, once the season starts. The Buffalo Sabres and Dallas Stars are said to be interested in the pursuit of Oduya. 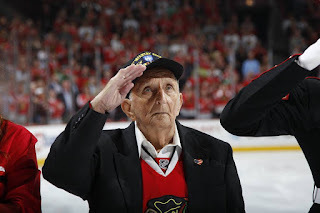 Speaking for all Blackhawk fans, I'd like to say, "Thank you, Johnny, for everything! And good luck!" RW, Roy Radke, 18, a 6th round pick (164th overall) at this year's NHL Draft, that came from the LA Kings in exchange for Daniel Carcillo in 2014, had a day to remember on the first day of the Chicago Blackhawks Prospect Camp today. Radke scored 3 goals as he lead Team A to a victory over Team B today 6-4. Highlights of today's scrimmage can be found here. Where Do The Hawks Stand Now that Sharp and Saad are Gone? The salary cap hit the Chicago Blackhawks hard again this off-season. First, the loss of both, Brad Richards and Antoine Vermette. Then, stars Brandon Saad and Patrick Sharp were moved to Columbus and Dallas. In return in those trades, the Blackhawks now received four starters that make in immediate impact in the starting lineup. Stan Bowman stated that he didn't want to trade for prospects and draft picks. He wanted players that would make a difference immediately. He did just that with the key acquisitions of Artem Anisimov and Marko Dano when trading Brandon Saad to the Columbus Blue Jackets. Anisimov has been inked in as the #2 center for Patrick Kane. Dano has not been set anywhere yet, but rumors have him playing the opposite wing of Kane while playing with Anisimov. Dano is a center by nature so there is a possibility of him as the #3 center. Dano, 20, in his NHL debut last year scored 20 points (8G, 13A) in 35 games. Patrick Sharp was traded to the Dallas Stars earlier this week and in return the Blackhawks received veteran defenseman, Trevor Daley and forward, Ryan Garbutt. Daley, 31, is a defenseman that plays as many minutes, if not more, than Johnny Oduya, 33, did. Daley also had career offensive numbers last year (16G, 22A). 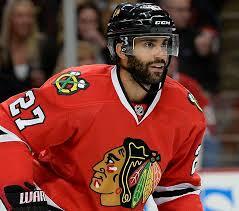 Oduya remains a free agent as of now, but is still waiting to see what Bowman can do to retain him. Garbutt is a veteran, role playing forward that could be used on a 4th line. This could be crucial if Bowman cannot bring back Marcus Kruger. Are the additions of these 4 new players enough to help replace what was lost with Saad and Sharp? Could Bowman have gotten more for them? Should they have held onto them? Time will tell, but for having to shed salary, Bowman in my opinion, did a great job in getting players that will make a difference right away starting next year. 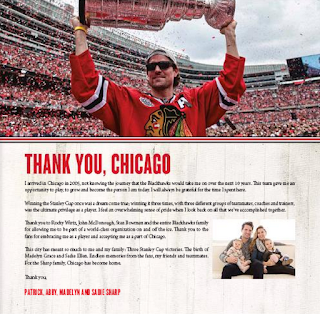 Patrick Sharp said goodbye in today's Chicago Sun-Times to Chicago and it's loyal Blackhawk fans. 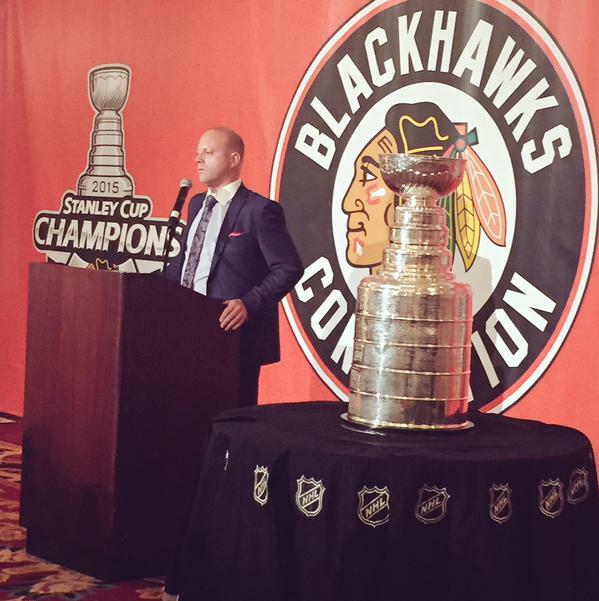 Sharp spent 10 years as a Blackhawk and was grateful for his time here. In today's Sun-Times, Sharp took a full page ad to say thank you to Chicago. I arrived in Chicago in 2005, not knowing the journey that the Blackhawks would take me on over the next 10 years. This team gave me an opportunity to play, to grow and become the person I am today. I will always be grateful for the time I spent here. Winning the Stanley Cup once was a dream come true; winning it three times, with three different groups of teammates, coaches and trainers, was the ultimate privilege as a player. I feel an overwhelming sense of pride when I look back on all that we've accomplished together. Thank you to Rocky Wirtz, John McDonough, Stan Bowman and the entire Blackhawks family for allowing me to be part of a world-class organization on and off the ice. Thank you to the fans for embracing me as a player and accepting me as part of Chicago. Chicago and it's fans feel likewise for all that Sharp did to bringing 3 Stanley Cups to Chicago. Good luck to you and your family Patrick. The Chicago Blackhawks traded Patrick Sharp today to the Dallas Stars today. Patrick Sharp had been a major piece of the Chicago Blackhawks for ten years. Blackhawks GM, Dale Tallon at the time, brought Sharp to Chicago in December, 2005, along with Eric Meloche, for Matt Ellison and a third round pick in the 2006 NHL Entry Draft. The Blackhawks made out on top by a country mile in that trade. Sharp, over his tenure with Chicago, accumulated some impressive numbers. In seven of his ten years, he amassed 20+ goals in a season. He ranks 8th on the Blackhawks All-Time list for Power Play Goals (65), Short-handed Goals (16), and Game-Winning Goals (38). The 3-Time Stanley Cup champion was also the All-Star MVP in 2011. 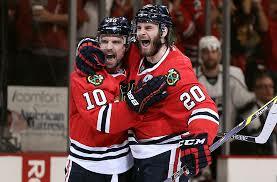 In 679 regular season games with the Blackhawks, Sharp accumulated 239 goals, 272 assists, and 511 points. 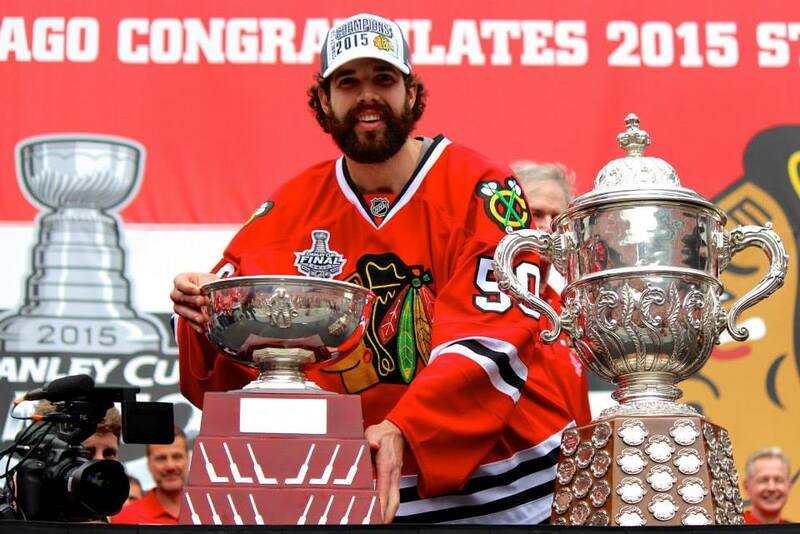 Although his 2015 season was one that found his number decrease, he provided leadership and experience that brought the Stanley Cup back to Chicago for the third time in six years. Patrick Sharp will forever be part of Chicago Blackhawks history and a fan favorite (especially for you ladies). Thank you, Patrick, and good luck! 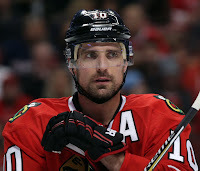 The Chicago Blackhawks made a major trade today by sending 10-year veteran, Patrick Sharp, along with promising young defenseman, Stephen Johns, to the Dallas Stars for veteran defenseman, Trevor Daley, and forward, Ryan Garbutt. The Blackhawks needed to make cap space and Patrick Sharp had been mentioned for a long time. The Blackhawks have lost a proven scorer, although his numbers slumped badly last year. In return, they received a veteran defenseman who can score, and eat a lot of minutes in Trevor Daley. 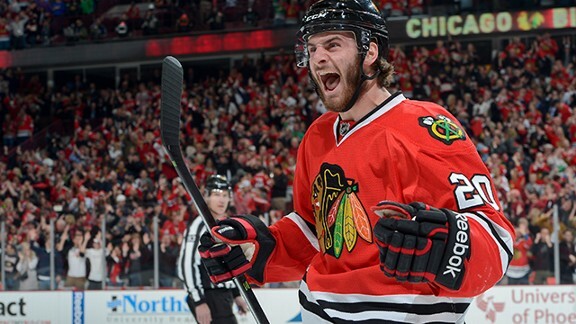 Included in the deal was 6' 4" defenseman, Stephen Johns. Johns was expected to make the starting roster this upcoming year with a shortened defenseive core. Johns will get his chance with Dallas. Trevor Daley, 31, a 11-year veteran, is a solid defenseman that will fit in well for the Blackhawks, but then the question becomes, is he the replacement for Johnny Oduya? If so, he is a very good replacement. Daley comes with 2 years left on his current contract that has a cap hit of $3.3 million. Last year, Daley played in 68 games for Dallas, scored a cereer high 16 goals and 22 assists for 38 points. Daley should play a key role on the power play for the Hawks. Of his 16 goals, 6 were scored on the power play to go along with 6 assists. Most importantly, he averaged 22:53 TOI. Something that we all know, the Blackhawks need. Garbutt, 29, also comes with 2 years left on his current contract while bringing half ($900k) of his cap hit of $1.8 million. Dallas is keeping the other half. Garbutt, a center, could possibly be a choice to be a 4th line center, which then leads to the question, is he going to replace Marcus Kruger? Where Garbutt fits in is unknown but with two years remaining on his contract, he will most likely be playing with the NHL club. 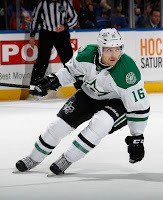 Last year, Garbutt played in 67 games for the Stars with 8 goals and 17 assists for 25 points. Combined, Daley and Garbutt make up $3.4 million of the $5.9 million that Patrick Sharp's cap brought. As of now, the Blackhawks are under the salary cap with $1.3 million available according to NHLNumbers.com. This would not leave enough room to re-sign Johnny Oduya and/or Marcus Kruger. There is still more dealing to be done (we hope). If Stan Bowman can find a way to shed Bryan Bickell ($4 million) and Kris Versteeg ($2.2 million), then it is possible that both Kruger and Oduya may come back. If so, then the Blackhawks defensive core is very solid going into next year. Let's hope that Bowman can keep the magic going. So what does everyone think of the trade? Good? Bad? 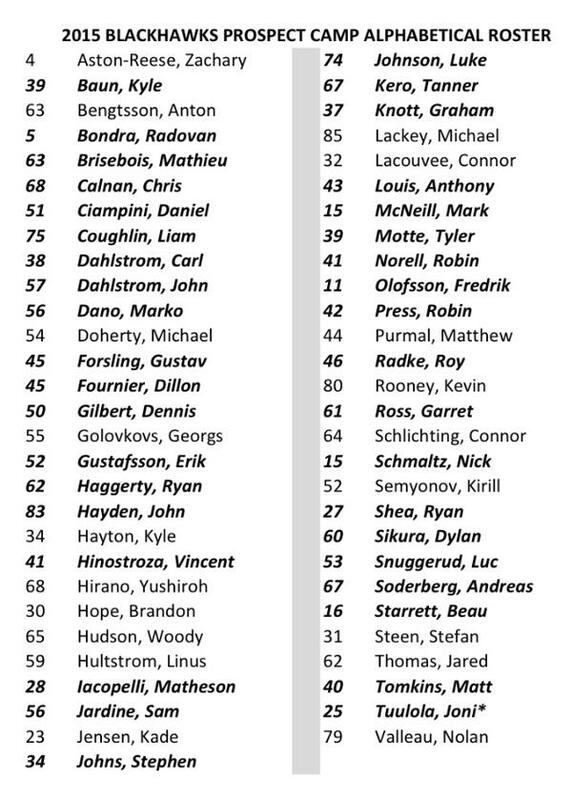 The Chicago Blackhawks have released the names of those invited to this year's Prospect Camp that runs from July 12-17. Among the anticipated prospects is newly acquired Marko Dano. Dano is expected to make the starting roster in the upcoming season. Others invited include all of the draft picks made by the Blackhawks in the NHL Draft two weeks ago. Among those, Graham Knott, Dennis Gilbert, and Radovan Bondra. Those returning to prove themselves to possibly make their claim to break the starting night roster are Mark McNeil, and Stephen Johns. What is odd was that there were some notable omissions that were not invited to camp. 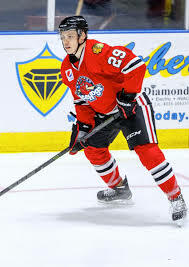 Philip Danault, a 1st round pick (26th overall) in the 2011 Draft spent the last 2 years with the Rockford Ice Hogs. Last year he played 70 games while accumulating 13G and 25A. Another surprise is that of Ville Pokka. Pokka recorded 8G and 22A in 68 games for Rockford last year. He was a key part of the Nick Leddy trade before the start of the season last year. Pokka is an offensive defenseman that the Blackhawks are hoping to be a key player in the near future. 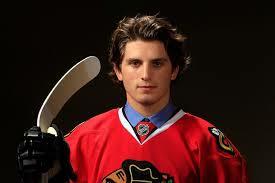 Ryan Hartman, a 1st round pick (30th overall) in the 2013 Draft, played 69 games for the Ice Hogs last year and had 13G and 24A. He played 5 games for the Blackhawks last year and was though to possibly break the roster as well. Why none of these players were invited to camp is a bit of a mystery. One thought is that since the Blackhawks need to somehow trade any of Patrick Sharp, Bryan Bickell, or Kris Versteeg, they may need to sweeten the deal with other teams by possibly packaging a promising prospect (see players above) in order to make a deal and get draft picks and/or prospects in return. The Blackhawks cannot afford to bring back any players in return that will hit their salary cap since they are trying to make room in order to bring back Marcus Kruger and Johnny Oduya. Again, we must play the waiting game while Stan Bowman does his thing. 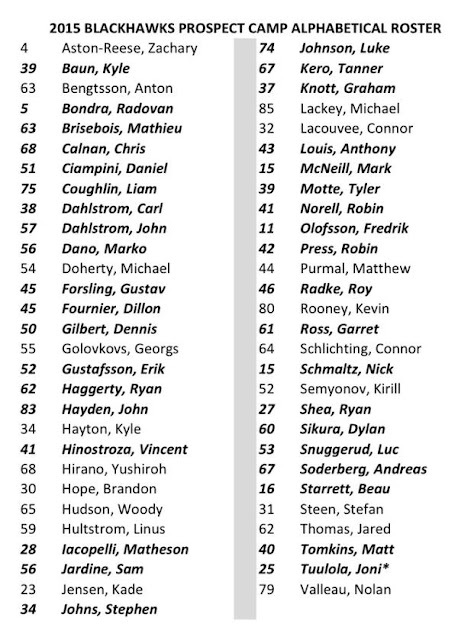 Below are all of the invited players to the 2015 Blackhawks Camp. 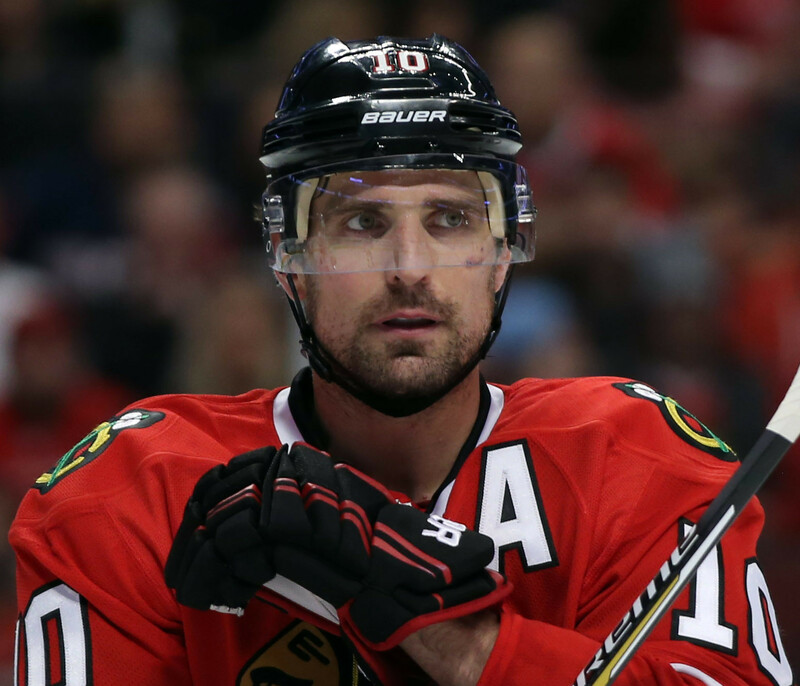 What Do The Blackhawks Do With Patrick Sharp? The Chicago Blackhawks still find themselves still without a suitor for Patrick Sharp. We've learned that part of the reason was due to the fact of what Stan Bowman wanted in return for him; A 1st round pick, an A-level prospect and a top 6 forward. Some would say, present company included, that the asking price was too high to pay for a 34-year old winger, whose number dropped dramatically last year. Rumors had the Dallas Stars at one point with a potential deal on the table for Sharp, but it was not to be. An offer for a 2nd round pick in 2015 & 2016, and a defensive prospect, but Bowman was not acceptable to it. Any trade with Dallas would have had to involve Antoine Roussel and Dallas would have nothing of that. One would think that what Bowman was looking for in a "top 6 forward" was a center to replace the tandem of Brad Richards and Antoine Vermette. With the trade of Brandon Saad last week, the acquisition of Artem Anisimov would fill that void. The question now is, would it be enough for Stan Bowman to lower his demands for a possible trade partner for Sharp. The other wrinkle in a delay of trading Sharp is that he has a limited trade clause where he would have to provide a list of 10 teams as to where he would allow to be traded to. A possibility is that a good percentage of those teams are in a cap pinch similar to the Blackhawks, where taking on Sharp's $5.9 million cap hit would be too great for them. Rumors are starting now about a familiar face that may be interested in Sharp; Dale Tallon, GM of the Florida Panthers. A possible deal may be in place, but a snag in Sharp's no trade clause may be holding up a potential deal. Stay tuned for a possible trade within the next few days, which could set the ball rolling for potential signings of Marcus Kruger and/or Johnny Oduya. 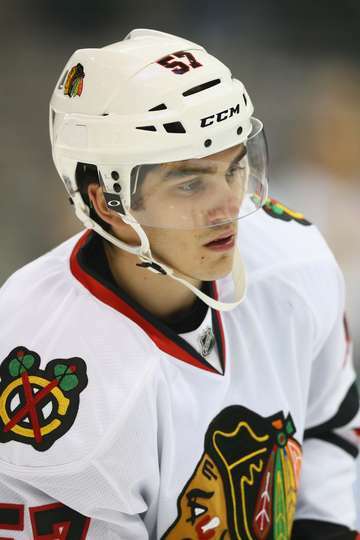 The Chicago Blackhawks today extended the contract of young defenseman, Trevor Van Riemsdyk. Van Riemsdyk is due $925k for the upcoming 2015-16 season. Stan Bowman pulled some magic from his hat and somehow convinced Van Riemsdyk to not only re-sign with the Blackhawks, but to do so by taking a paycut/hometown discount. Van Riemsdyk's new contract is a 2 year extension that is worth $1.65million (a cap hit of $825k). Van Riemsdyk joined the Blackhawks last year as an undrafted free agent on a two-year entry level deal. He played the first 18 games in 2014-15 with the Blackhawks before suffering a knee injury against Dallas. After successfully recovering from his injury, he injured his wrist while with the Blackhawks AHL affiliate, Rockford IceHogs and was thought to be lost for the rest of the year. 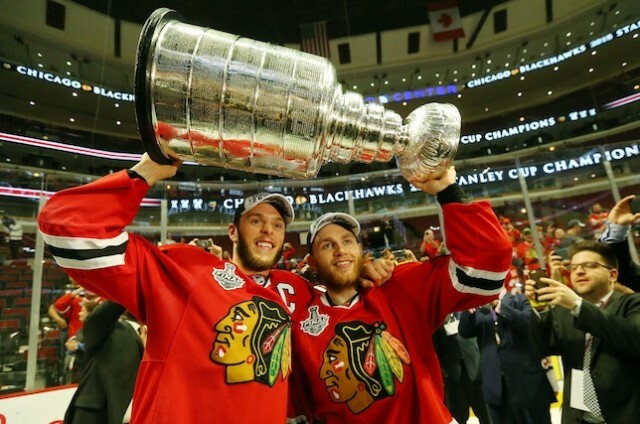 With an unfortunate season-ending injury to Michal Rozsival, and poor play from fill-ins David Rundblad and Kyle Cumiskey, Van Riemsdyk was given an opportunity to play on the biggest stage imaginable, the NHL Stanley Cup Finals. Coach, Joel Quenneville, found himself with a reduced defensive squad during the Finals against the Tampa Bay Lightning and needed to find someone to eat minutes. Van Riemsdyk averaged a little over 7 minutes a game and did a good job defensively. Stan Bowman's signing of Van Riemsdyk strengthens a thin third defensive pairing, and locks in a young, talented, stay-at-home defenseman for the next 3 years. The future keeps getting younger and talented for the Chicago Blackhawks. Patience is a game that Stan Bowman has played and played well for quite a while. Being able to dismantle the 2010 Stanley Cup Blackhawks team and able to reload with picks. He has kept this team competitive every year of his reign. Now, he plays a chess game with two key pieces that they really need to bring back, Marcus Kruger and Johnny Oduya. According to reports, "Things are progressing OK. Nothing to report, but nothing to worry about either." The biggest reason for the delay is because of the situation Bowman finds himself in with trying to make room under the salary cap. A deal can't be made until something is done via a trade (Sharp, Bickell, or Versteeg). Both sides are still working together patiently. Kruger has spent his entire 5-year NHL career with the Hawks. A 5th round draft pick from the 2009 draft, Kruger has been a very important piece of the penalty killing unit as well as matching up against top scoring lines from opposing teams. Johnny Oduya is in a similar situation, but his is a bit more dangerous. He is currently sitting on a deal from another team, but is patiently awaiting to see what happens with the cap situation with the Hawks. Being a veteran, one would think that Oduya has been through this before, and is willing to wait to see what the Hawks can do. One would hope that a hometown discount will come into play in order to keep him. Oduya has been a cornerstorn on the 2nd defensive unit with fellow Swede, Niklas Hjalmarsson since coming here in 2012. Mid-way through the playoffs last year, Oduya played an even bigger role as a season-ending injury to Michal Rozsival caused him to log a lot of extra minutes. Bowman has stated, "We would like to try to bring him back; we have financial hurdles we're working through." To play devil's advocate, Bowman mentioned similar things when talking about Brad Richards and Antoine Vermette, yet they went and signed with other teams. One would hope that he would keep not only the nucleus, but some of it's key surrounding elements together as well on this team. Time and patience will tell what comes of these two players that have played such big roles over the last few years. Does Bowman have yet another check-mate up his sleeve? Marian Hossa and newly acquired Mark Dano both hail from Slovokia. As Blackhawk fans we think, 'good, maybe there will be a connection between the two and they will help one another'. According to letsgohawks.net, there is a closer tie than we originally thought that should get Blackhawk fans even more excited. Dano grew up being a big fan of Hossa, but not only that. Hossa's mentor when growing up? Dano's father! Now Hossa can be that role model for Marko. Someone queue the 'Circle of Life' song from the Lion King! 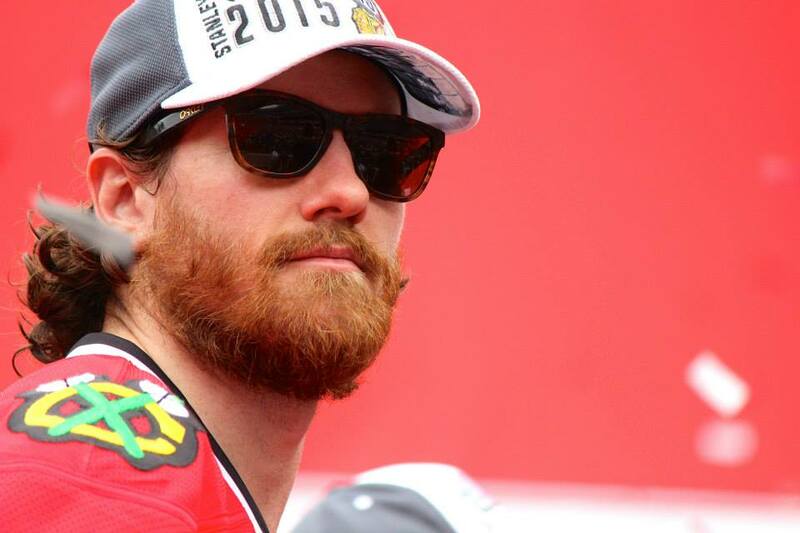 Two Blackhawks Marathons You Don't Want To Miss!